Muslim land-grabbing creativity knows no bounds: in central Jerusalem, Arabs are building a fictitious cemetery where no one is buried. In the heart of Jerusalem, dozens of new tombs are being added to an ancient cemetery, but no one is buried beneath them. 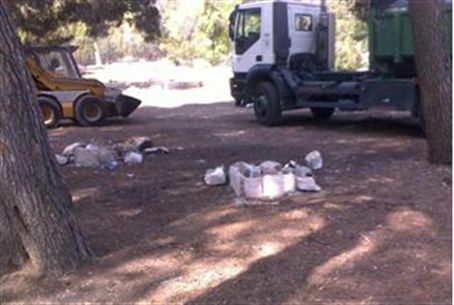 Jewish observers and sources in the Jerusalem Municipality say the pretend-graves are simply a Muslim project for grabbing land. The Mamilla Cemetery is located on the outskirts of Jerusalem's Independence Park (Gan HaAtzmaut), between Agron and Hillel Streets. It is an ancient Muslim cemetery containing several dozen graves, which has been in a state of severe disrepair for more than a century, despite being under the supervision of the Muslim Waqf. In recent days, however, there has been much hustle and bustle in the cemetery, and its seems to be growing from day to day, cutting into land that is a part of Independence Park. Trucks, tractors and other heavy machines come and go, dumping building materials, which workers then shape into Muslim-style tombstones with no one buried beneath them. Dozens of these faux-graves are being created on the eastern end of the park, in row after row, where only bare earth and grassy areas existed until now. Some of the fake tombs have been completed and others are in the process of being built. Arutz Sheva's Chezki Ezra visited the site following a tip from a local resident and was surprised to see many dozens of new "tombs." He estimated their number as approaching 100. Another worker at the site said that the “tomb planting” project was being financed by a rich Muslim from one of the Gulf states. Yet another employee said that the police “instructed the Muslims to stop their activity immediately” but that they are ignoring that instruction. The apparent impotence of Jerusalem authorities in the face of brazen Arab land-grabs is also apparent in the matter of a huge wall that has been built around a Turkish cemetery. The Muslims may be taking advantage of Israeli reluctance to act assertively regarding its land, in the face of pressure from the Obama administration over Jewish construction in Jerusalem, Judea and Samaria, and the razing of illegal Arab structures there. Photos: materials for new tombs after being dumped at the site, and after being shaped into 'tombs'.